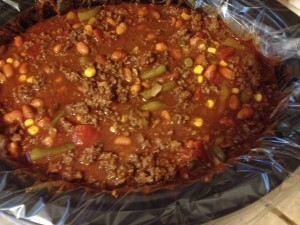 I call it almost homemade because I usually buy a chili mix kit with seasonings already together. However you can just mix up your own spices to taste, ground chili pepper, garlic powder, cumin, oregano, onion powder cayenne pepper, salt and pepper. 40 oz can of Sun Vista pinto beans (my husband will only eat this kind of bean). You can add two cans as well. Sometimes I add a can and a half. It’s all what you make of it. .28 oz can of crushed tomatoes. You can add two cans as well. I start the ground be browning and I toss everything else, except the seasoning mix, into the crockpot. When the beef is browned, I drain it, I toss in the seasoning packet and a little water. Let it cook for about 5 more minutes to flavor the meet. Then I add it into the crock pot. Cook on low for about 6 hours. I serve it in bowls and top with cheddar jack cheese.